Why Storytelling For B2B Content Strategies? Did you know that when we hear a good story, our levels of oxytocin increase? Indeed, research shows that stories can be up to 22 times more memorable than facts alone. Humans are hard-wired to be drawn to narratives; and as a result, including storytelling in B2B marketing is proving increasingly effective. From an early age, stories help us make sense of the world around us. Stories help us communicate our experiences and help us learn. Ultimately they help us find answers to our challenges - whether personal or work-related (think: case studies!). Successful stories have the ability to build powerful, memorable and long-lasting connections. Stories help us communicate our experiences, they help us learn. Ultimately they help us find answers to our challenges - whether personal or work-related. As a result, effective brands today are those that understand the power of storytelling and incorporate it into their content marketing strategies to build rapport. They don’t just engage customers, they build evangelists; committed, loyal fans who buy into the brand story and feel strongly enough to share it with others. With such an overcrowded marketplace, storytelling is an increasingly fundamental part of modern marketing strategies. With such an overcrowded marketplace, storytelling is an increasingly fundamental part of modern marketing strategies. To successfully tell your own story, you’ll first need to have a comprehensive understanding of your buyer personas - and your own company. Storytelling isn't only for B2C, it's core to creating engaging B2B content. Start by clarifying your brand understanding; identify your ‘why’ - why your company exists, and what challenges you help your audience solve. Next, consider your persona audience themselves. Always keep your personas and their challenges in mind when creating any content for your brand. Keeping this as your focus is an important step to ensure your content strikes the right tone, tells a relevant story and holds your audience’s attention. Identify your ‘why’ - why your company exists, and what challenges you help your audience to solve. Rather than leading with your solution (and focusing on your brand), you should first set the scene outlining your customer’s challenges and goals - before demonstrating how your business can help. Customer-focussed content ensures your audience sees themselves in the situation - this is why tailoring your content into formats such as case studies or guides can help to tell the story of how your existing clients - with similar problems - have achieved great results with your help! Your customers are the reason your business exists, so they should be at the heart of any story you’re telling. While it's tempting to tell the story of your business or services alone - a customer focus will help you build a sense of recognition, empathy, and trust. Choosing to incorporate storytelling into your content strategy doesn’t mean you need to invent a story. Rather, as part of your brand story, consider how you can prove your credibility; many prospective clients will want to know how others have seen success with your business before they engage with you further. Again, customer testimonials and case studies are a great way to humanise your brand. There is nothing more powerful than letting your customers tell the story for you, so make it easy for your customers to share their experiences of how your business helped solved their pain. Today’s buyers thoroughly research products as well as seeking out advice from family, friends, and colleagues - they’re more likely to trust your business if they can see that other people do too. What makes your organisation different? Storytelling is an easy way to highlight why your business is unique. But while your services may be similar to your competitors - it’s how you tell your story that can help you stand out from the crowd. Stories that evoke emotion are particularly effective at capturing people’s attention. Once you start viewing people as humans rather than profiles or buyers, the act of storytelling becomes more natural and conversational, helping you build client relationships. If you’re not sure where to begin, Simon Sinek’s Golden Circle can help when it comes to telling your business story. It considers three layers of information; Why, How and What. The 'why' is the most fundamental aspect of your brand story; it’s the core belief of your business and the reason for its existence, so is often the most personal and emotive aspect of your story. The two outer circles explain 'how' you do what you do, and 'what' your business actually does to meet that 'why'. 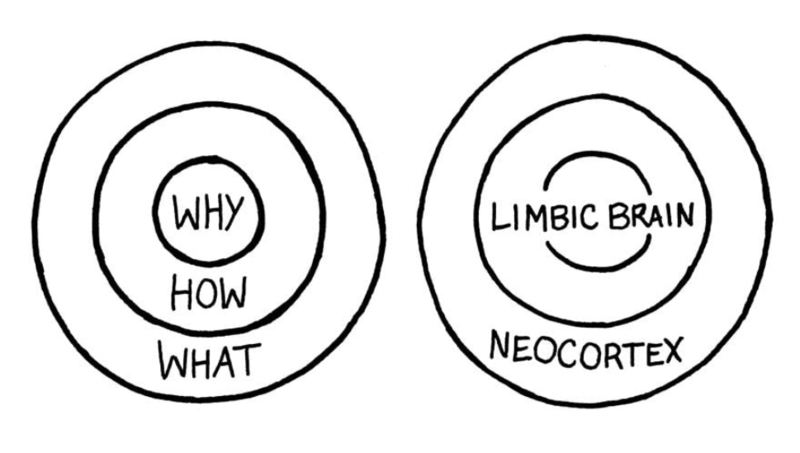 Sinek’s circle also corresponds to the functions of the brain: the 'what' relates to the rational part of our brain (the neocortex), while the 'why' and 'how' correspond to the limbic system - which is responsible for feelings such as trust and loyalty. As a result, starting with the ‘why’ can be a very powerful means of communicating with your audience. Regardless of how you incorporate storytelling in your brand - whether you consider the 'why, how and what' in your site copy, blogs, videos, social media and other content assets - considering your story and main characters (your brand and your audience) will help to humanise your brand, to ensure you engage and stand out. 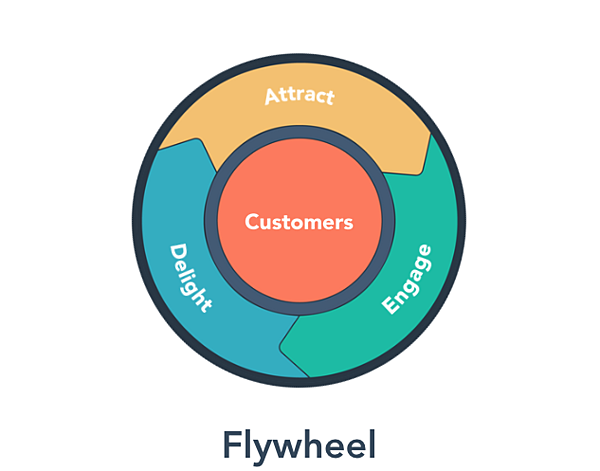 HubSpot’s flywheel diagram is a great way to visualise the customer-centricity that should run through your content marketing efforts, placing the customers at the centre of the story. So, show people that you understand their problems and that you can help - give them a more compelling reason to engage with you, rather than competitors!